website, shopping cart, and integration. Get the Ecommerce solution built for your brand - incorporating your logo, colors, and culture to create the perfect user experience. Create a private marketplace allowing clients worldwide to view products, check availability and place orders. 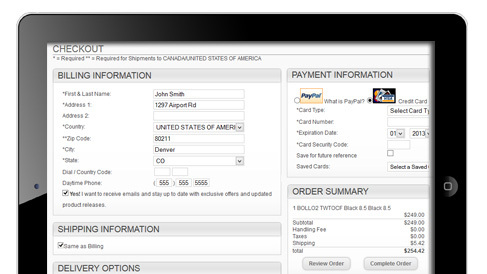 Keep your clients interested in your products with smart cart features that include; suggested items, and cart tracking. Facilitate orders around the world with multilingual and multi-currency capabilities, alongside built-in tax and freight calculators. E-Commerce for the Digital Age. Connecting with the consumer is a high-paced, complex process taking place in a competitive marketplace. As today’s consumers demand greater choice and shopping options; your e-commerce must rise to the challenge. Whether you sell hard-goods, consumer-goods, or any other product; our ECOM software is able to handle both business to business (B2B) and business to consumer (B2C) transactions. Through system optimization and integration your business has a single hub for all your channels; streamlining your business from sale to ship. Everything you need is available all in one space. 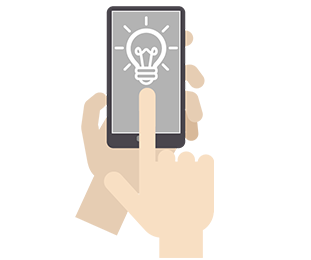 Control user experience and run your online business with ease. With the ability to manage unlimited products and inventory, you’re able to build your website – your way. Offering the tools you need to manage everything from product displays to front page content; your site will be both beautifully designed and functional. Learn more about the e-commerce solution that allows you to accelarate growth, while keeping up with the rapidly growing and changing online marketplace. What’s Included in FDM4’s E-Commerce? The mark of any successful business is the ability to leverage the power of the internet as a sales tool. FDM4’s e-commerce solution provides you with the ability to expand your revenue, enhance service, all by re-engineering the way you look at your business process. There are 100+ generic website builders out there – and thousands of sites that all look the same. Our e-commerce solution offers you a branded solution; built to meet your needs, and the needs of your client base. Providing your clients with a source of information on everything from stock to current levels allows them to create a secure login and create that much needed link between consumer and vendor. Don’t rely on a generic site builder when you could have a site built for you; by you. 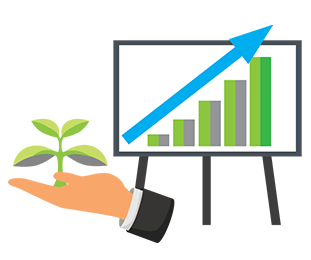 Our e-commerce secures your growth by giving you control over everything from pricing and promotions, and more importantly, is capable of linking to your back office. Your site will be filled with real-time information on product selection, inventory levels, freight costs, and tax costs; and your customers will be able to access it all through a simple click. FDM4’s E-Commerce solution integrates into your ERP solution; forging the connections that keeps your business flowing. A software that eases the flow of information; our e-commerce solution links your e-store to your back office. With integration at the core of our design, our software is built to provide your clients with real time data while feeding orders from your site directly into your ERP. You’ll never lose time on data duplication again. Order & inventory information is able to travel through multiple systems to ensure accurate levels, statuses, credit information, and inventory are always available. Every order placed on your site is available in real-time, across your software; allowing you and your customer a 360 degree view from reception to final shipment. The days of cold-calling clients is behind you – your customers are operating in real-time online. Your customers are doing 90% of the leg work – they already know you, your brand, and the items they want before they ever place their order. Customers are savvy and know their way around cyber space, you need an e-commerce solution that rises to meet their needs. With live stock level, clients will shop with confidence knowing that the items they are seeing are currently available. Our system ensures that clients have at-a-glance access to the information they most need including; shipping costs, tax calculations, tracking, and payment options. Your customer service representatives will be able to reduce the amount of time they spend assisting clients with basic service calls and focus on promotion, content, strategy implementation, and of course driving sales. Self-service increases engagement and drives customer satisfaction allowing you to increase account sign ups and sales. Beauty meets functionality with FDM4’s templated design. You don’t need to be a programmer to have a beautiful, user friendly website. 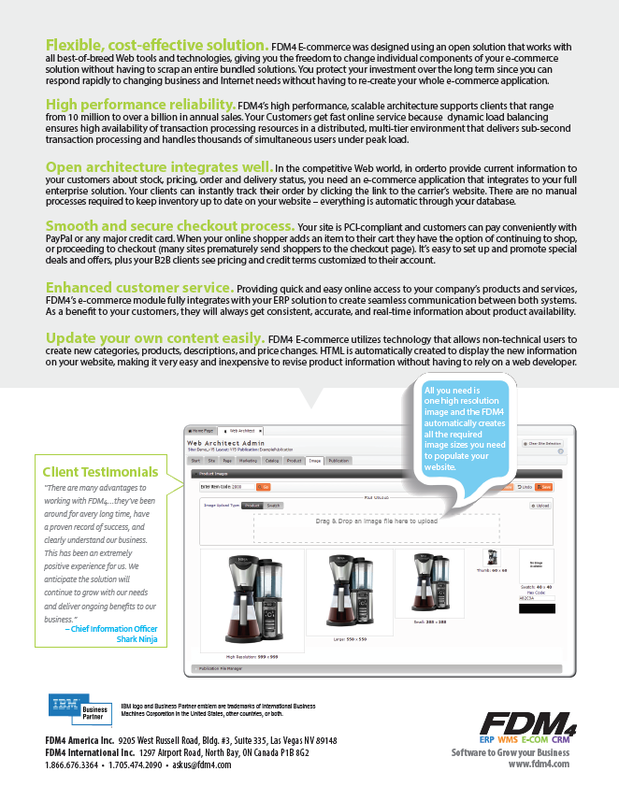 Set-up and manage your site right off the bat with FDM4’s easy to use templated e-commerce. 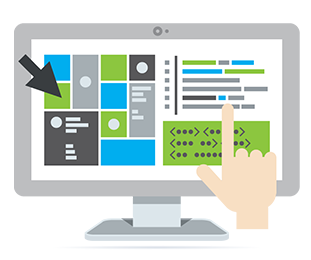 From creating eye-catching headers to selecting your catalog layout; the tools you need to personalize your site, and complete a fully branded look are available at the touch of a finger. 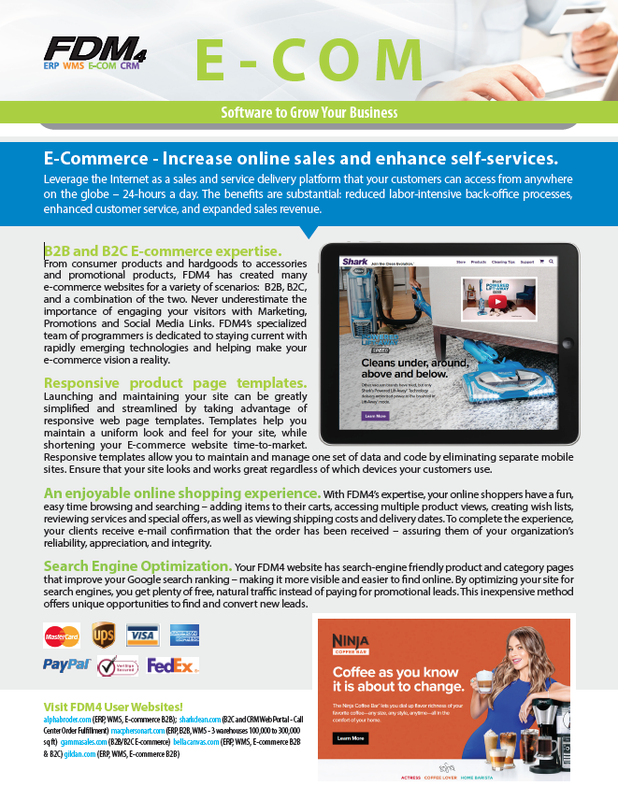 Captivate your client-base with an e-commerce solution that allows you full control over your site, while maintaining your business data elements and connectivity; creating a powerful consumer-based web presence. You’ll be able to build out social elements on your site to build your marketing power. Simple to use features allow you to add all the elements you need to add social sharing to your site. A beautifully designed site that offers real-time functionality encourages your clients to stay and explore. Go ahead; build the site you’ve always dreamed of – without the stress of learning to code. Built to meet the unique needs of wholesalers in every industry. FDM4 offers an e-commerce solution that is flexible enough to meet the unique needs of wholesalers & distributors. Connect with retailers, re-sellers, decorators, and anyone else in your supply chain; all within an interactive web environment.  Your clients will be able to access up to date information on supply levels, shipping costs, and tax calculations. On top of that, because our e-commerce integrates into your ERP solution. Orders can be processed and then transferred to your WMS for shipping – without ever having to duplicate data. This not only allows you to save time; but gives your clients an up to the minute status on their order. Clients will be able to register as a business on your site; allowing them to access any special pricing and features for bulk orders that you provide. FDM4’s ECOM is designed to allow you to create the best online shopping experience for all of your customers. Consumer products to hardgoods, accessories to promotional products – FDM4 has create multiple business-to-business e-commerce websites. 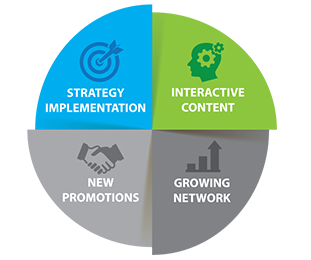 Our B2B solution provides you with a flexible template designed that integrates seamlessly into your ERP software. Build a site that allows you to easily connect to your suppliers, manufactures, distributors, and customers – while feeding all of your critical business data into a single, smart dashboard. Adopting our B2B solution allows you to better meet the demands of your customer through the re-imagination your back-office processes. 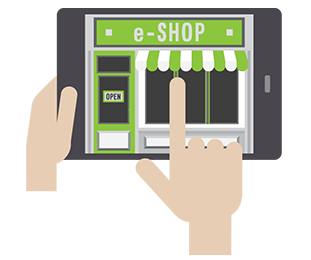 Our ECOM application leverages the power of the internet; giving business partners and suppliers access to information any time they need it – day or night. Orders placed feed directly into your ERP; while your inventory levels are reflected back into your site’s catalog in real time – eliminating the need to duplicate data, and creating a more user-friendly environment. FDM4’s Business-to-consumer e-commerce solution is custom built to make your company stand out; without needing to know HTML. With an unlimited number of static pages available and templated designs; you’ll be able to create a site that truly represents your brand. Draw customers in by offering consumer loyalty programs, discounts, and clearances, and use integrated tools like MailChimp to build a consumer base you can market to. 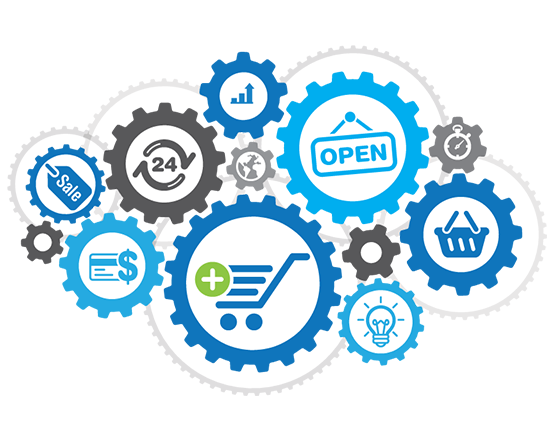 Our e-commerce solution has SEO capabilities built in through the use of metadata and short URLs. Related products and “see what other customers purchased” areas on product pages invite customers to stay and explore your site; while linked pages and time on page improve your search engine visibility. On top of that, we recognize the need for your site to be linked in to the latest social media. That’s why we’ve made it so customers can wishlist, like, share, tweet, or pin your products – increasing your global branding capabilities.